Aki” is the Anishnaabemowin word that encompasses earth, land, place. 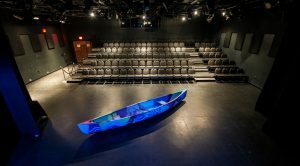 Native Earth Performing Arts helms a beautiful black box, creation/rehearsal/performance space in Regent Park. Aki Studio is available for performance rentals, and flexible enough to become your new favourite venue for special events. Our 120 seat black box studio is fully accessible for both patrons and performers. In keeping with the values of Native Earth, it was imperative in the planning of this venue to create an accessible, functional and safe space in which to nurture our growing artist and patron base. Aki Studio is equipped with a comprehensive technical rig with flexible seating arrangements. Though our capacity is 120, a standard proscenium configuration comfortably allows 118 seats. Our backstage boasts two dressing rooms, a wheelchair accessible bathroom and laundry facilities. Aki Studio is fully accessible for both patrons and performers.